A vintage inspired business card template perfect for retail, design or cosmetics brands. A botanical illustration paired with a classic serif font make for the ultimate luxury look! 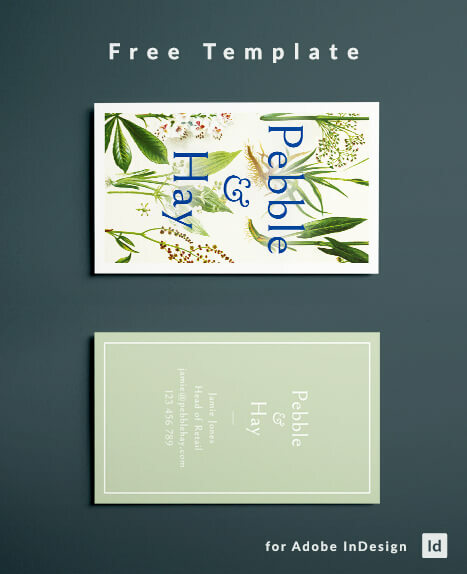 Botanicals and vintage designs are in fashion in a big way, this free business card template for InDesign combines the two to give your business a luxurious and trendy feel. Picking up the natural shades of the illustration the layout is a soothing combination of blues and greens. The reverse of the card has an elegant slim border and a sage green background. 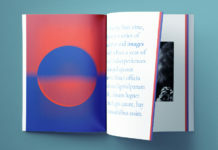 Below you can preview the business card design with two different color schemes, download the InDesign file and read up on a few helpful tips for editing your template in InDesign. Get the high res image used in this template free via Depositphotos. We’ve put together a collection of helpful tips to make editing our InDesign Templates super easy. If you’re a newbie to Adobe InDesign it’s worth checking these out before starting work on your design. Step 1. Download the file. Step 2. Our InDesign templates are packaged and saved as ZIP files. If you have a Windows computer Right Click > Extract All before opening the InDesign file. Step 3. If you’re running InDesign CC open the INDD version of the file. If you’re working with InDesign CS4, CS5 or CS6 open the IDML version. Our InDesign templates are organized into layers, which group similar elements together. The layers in your document can be controlled from the Layers panel (Window > Layers). Make sure to hide the SWITCH OFF BEFORE PRINTING layer when you export your design for printing. Click on the eye symbol to the left of the layer’s name to do so. Pro tip: Try locking the YOUR IMAGES HERE layer to save time when editing text. This will prevent you from accidentally moving the graphics out of position. The color scheme of this template can be edited from the Swatches panel (Window > Color > Swatches). Pro tip: Editing a swatch will automatically update all instances of that color across your document. The text across this design can easily replaced with your own copy. Simple use the Type Tool (T) to select the text box you wish to edit. You can then add your own fonts and formatting. Read more about formatting text in InDesign. You’ll notice when you first open the template that all the image frames have a placeholder image. You can insert your own images by selecting the image frame and using File > Place to select a replacement image. Read our beginner’s guide to working with images in InDesign. Pro tip: Do your images look blurry? Make sure your display is set to high-quality (View > Display Performance > High-Quality Display). To see more accurately how your design will appear when printed go to View > Overprint Preview. It’s simple to resize a page in your template by using the Page Tool (Shift+P). Select the tool and then click onto the page to select it. You can drag the sides of the page to preview your desired new size. Hold down Alt or Option while you drag to resize the page. Read more about resizing pages in InDesign. Once you’ve completed work on your template and you’re ready to print it, or export it for digital circulation, you can head to File > Export. To create a print-ready file, choose Adobe PDF (Print) from the Format drop-down menu in the Export window. Make sure to include the bleed in your export options by checking Use Document Bleed Settings in the Export Adobe PDF window. Read more about prepping your designs for printing in InDesign. You can format individual items of text using the Type Tool (T) and Controls panel, which you’ll find running along the top of the InDesign workspace. The fonts in most templates are not set as InDesign styles. However, it’s easy to create a Character or Paragraph Style using existing text formatting, and then edit this from the Styles panels (Window > Styles). Read more about editing Styles in InDesign. Discover more advice for InDesign beginners on our Tutorials page. Or why not seek out inspiration about typography, layout design and much more right here. InDesignSkills makes learning InDesign fun! We offer tutorials, quick tips free stylish templates and inspiration. InDesignSkills is run by a community of graphic designers, illustrators and print experts.